In this short, elegant, and very clearly written volume Nicholas Vrousalis sets out to provide a unifying account of the thought of the contemporary political philosopher, G.A. Cohen, who died in 2008. It is the first book-length study of Cohen’s work, who came to prominence in 1978 with the publication of his Isaac Deutscher prize-winning book Karl Marx’s Theory of History: A Defence (expanded edition, 2000). It was probably the first major contribution to what has become known as “analytical Marxism”, and received immediate acclaim, but also thorough critical attention from a variety of scholars. Cohen began to accept that there were a number of difficulties with the theory as a theory of history, although he never wavered from his belief that he had produced a theory that was faithful to Marx’s writings and intentions, although that has been a highly contested issue too. Parallel to his work on Marx, Cohen also deeply engaged with contemporary theories of justice, taking on, in turn Robert Nozick, Ronald Dworkin, and John Rawls. Although Cohen was regarded by many as an equal to his targets, and was extremely well-known for a large number of distinctive arguments and insightful positions, he never attempted to put everything together into an overarching structure. Hence Vrousalis has set himself quite a task in bringing out a unity to Cohen’s thought. 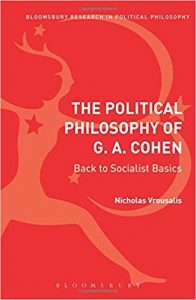 He has done well to identify a primary theme, identified in the subtitle of the book – Back to Socialist Basics – and I find it compelling that this ambition drove much, perhaps all, of Cohen’s work. Yet it remains to be seen how it can be cashed out in more detail, given that Cohen’s published output spanned forty years. Vrousalis breaks his study into an introduction followed by six thematic chapters, arranged broadly chronologically, although with much reference back and forth. The Introduction explains how Vrousalis proposes to find unity in the diversity of Cohen’s work. He correctly observes that Cohen’s political philosophy was animated by lifelong commitment to the feasibility and desirability of a fully emancipated humanity. He also suggest that Cohen offers a “secular theodicy”, though for myself I’m not so sure this helps bring out a major aspect of Cohen’s work, as distinct from describing the early, explicitly Marxist, phase. However the notion of achieving a fully emancipated humanity is a helpful observation, and provides a type of motivational unity, whether or not that issues in any sort of theoretical unity. The first main chapter discusses Cohen’s account of Marx’s theory of history. Cohen is known as a defender of a form of technological determinism, in which the primary governing explanation of historical change is the tendency of the productive forces to develop, and for economic structures, and indeed superstructures and ideology, to rise and fall as they further or impede that growth. Vrousalis notes that this development is also represented as the material productive forces having primacy over their social form. The account of Cohen is clear and accurate and can serve as a helpful introduction, explaining Cohen’s theory and its motivations, and also provides analysis of some of the debates within analytical Marxism, exploring criticism by Jon Elster, Erik Wright and Joshua Cohen. Vrousalis, it seems, is not convinced by Cohen’s account, drawing on criticisms by B.T. Coram that suggest it is not possible to make the sharp analytical distinction between material and social properties of society that Cohen feels he requires. Cohen believes that if the material is to explain the social then it is vital that they can be characterised independently of each over, for otherwise the explanation runs the risk of circularity. Indeed Coram’s criticism that this distinction cannot be fully made is similar to arguments made by Richard Miller, and Vrousalis provides an exposition of Miller’s work Analysing Marx (Princeton NJ: Princeton University Press, 1984), which develops Miller’s earlier critical remarks into a full-blown interpretation of Marx. Miller attempts to rescue Marx from two restrictive assumptions made by Cohen. One is substantive. Miller denies that the productive forces, for Marx, are always the primary source of historical change. The other is methodological, in effect accusing Cohen of having an out dated and stultifying neo-positivist conception of rigour that forces an aspirational level of conceptual hygiene that not even the sciences can achieve. In Miller’s view, much of the effort spent trying to generate sharp distinctions, including the distinction between social and material properties is wasted, and semi-circular explanations are more common in science than many people realize. Vrousalis seems to agree that Miller offers a more plausible account of Marx’s theory of history, but also flirts with the idea, preferred by some interpreters, that strictly speaking Marx did not have a theory of history at all. The next chapter turns to the topic of freedom, and the part of Cohen’s career in which he attempted to refute the libertarianism of Robert Nozick. This also involved much energy spent considering the thesis of ‘self-ownership’ and how it relates to ‘world-ownership’. Here, again, the account is accurate and helpful, showing excellent understanding of Cohen’s views and the context in which he wrote. In this case relatively little criticism is registered and the account is generally highly sympathetic. Similar remarks can be made of the following chapter, on equality, focusing on Cohen’s important paper ‘On The Currency of Egalitarian Justice’. Cohen approaches equality through the Dworkinian device of distinguishing between ‘ambitions’ for which one is responsible for, and ‘endowments’ for which one is not. Both Dworkin and Cohen seek to extinguish the effect of ‘brute luck’ on distribution, leaving room for differential rewards for ‘option luck’ (a theory that came to be called ‘luck egalitarianism’). Although Cohen registers important objections and modifications to Dworkin, his theory broadly follows Dworkin’s paradigm. Both the chapters on freedom and equality serve as excellent summaries of Cohen’s complex and diverse writings on these topics. I would only add that in the chapter on equality Vrousalis makes some important connections and contrasts between different elements of Cohen’s work. Early in the chapter he remarks that the concern with the nature and definition of the “currency” of egalitarian justice provides a link back to socialist conceptions of equality. But towards the end of the chapter Vrousalis remarks on the rather uncomfortable juxtaposition between Cohen’s adherence to Marxism and his advocacy of a theory of justice. The superficial tension is apparent: Marx’s own refusal to argue in terms of justice is well-documented, and has created an extensive literature of its own. How then can a Marxist justify advocacy of a theory of justice? But for Vrousalis the issue plays out in a somewhat different fashion. One highly optimistic assumption of Marx, at least on Cohen’s reading, is that in the communist society of the future human productive power would be so highly developed that there need be no material disputes between people. Disputes are born of scarcity and scarcity has been overcome by what Cohen calls a “technological fix”. But Cohen suggests that Marx neglected resource constraints, and hence the technological fix is out of reach. Accordingly, to have some version of a socialist society we cannot rely on technology, but must harness human benevolence. Hence the need for a theory of justice, not only to describe a just society but to help motivate people to bring it about. Cohen’s materialism, therefore, is in conflict with Cohen’s advocacy of equality. Vrousalis says that he does not know how to resolve this interpretative dilemma, which is a surprise to me, for I had assumed that by the time Cohen turned his efforts almost full-time to political philosophy he had largely abandoned the Marxism of his early writings, at least in letter, if not spirit. Chapter four takes on the topic of exploitation. This is much more home ground for Vrousalis, for it is an area on which he has produced his own original and important work. Cohen’s most prominent contribution on this topic was his 1979 paper ‘The Labor Theory of Value and the Concept of Exploitation’, in which he argued that the Marxist theory of exploitation does not in any way depend on the labor theory of value, despite appearances and common belief. Cohen suggests that at the heart of the theory of exploitation is essentially the idea that the capitalist extracts a surplus to which he or she has no moral entitlement. Vrousalis ably compares Cohen’s work to Roemer’s and raises questions about whether ‘clean’ capitalism is possible without exploitation, if the capitalist had come to own the means of production through a morally acceptable route. And there is also a question of whether extreme conditions of work could still be exploitative even if the capitalists have moral title to the means of production. Cohen’s writing on this is incomplete, and so Vrousalis has to suggest the most plausible way of filling in the gaps. But even so, he argues that the best account of Cohen’s theory remains flawed, and Vrousalis offers his own theory as a better alternative. He suggests that, exploitation involves the instrumentalisation of vulnerability to appropriate the fruits of the exploited person’s labour. Of course on the face of it this has its own problems, for exploitation does not always involve the extraction of the fruits of labour. Even those who owe all their wealth to inheritance can be exploited. Vrousalis accepts that the account given here needs expansion, which is a task taken on elsewhere. Vrousalis points out that Cohen makes use of the term ‘exploitation’ in another prominent place; in the ‘On the Currency of Egalitarian Justice’, mentioned above. Here Cohen says that the ‘primary egalitarian impulse is to extinguish the influence on distribution of both exploitation and brute luck’. This is puzzling, for exploitation at the level of social justice normally presupposes a class structure, yet in the ideal theory of the forms of egalitarianism under discussion, there are no social classes. Indeed, as far as the notion of exploitation is relevant to the concerns of Cohen, Dworkin, and others in this debate, it is not the exploitation of the worker by the capitalist, but the exploitation of society by the free rider, such as the person who could work, but decides to claim welfare benefits instead. Although there is no reason why a single theory could not encompass both forms of exploitation, it could not, it seems, be a Marxist theory based on differential access to the means of production. One further aspect of this chapter is worth briefly noting. Vrousalis correctly points out that, following Sweezy, Cohen interprets Marx as offering a theory of equilibrium price, which sets up the argument disassociating the labour theory of value and exploitation. Yet Vrousalis raises the question of whether Marx is better interpreted as giving a sociological theory rather than a theory of prices. Vrousalis cites Rubin as a possible source for such an interpretation, but, realizes, unfortunately, that this is not the place to take it further. An interesting chapter on community follows. This is another task of reconstruction as it is not something that Cohen explicitly did himself, although reflections relevant to the idea of community are prominent throughout Cohen’s work, especially in his important critique of Rawls on incentives, which is dealt with very well here. Vrousalis’s own contribution is to attempt to bring out a conflict between Cohen’s commitment to equality and to community. One way in which this can be seen is that Cohen’s endorsement of luck egalitarianism will, in principle, allow the existence of large inequalities if they are result of option luck. Yet large inequalities could upset a sense of community. Hence, rather paradoxically, community could rule out some inequalities permitted by equality. Vrousalis suggests it is unclear how Cohen would have dealt with such conflicts, but emphasizes that Cohen’s pluralism about values means that he would not dogmatically insist that any value must always take priority. The final chapter looks at socialism and the market, exploring some of Cohen’s unpublished work on David Miller on market socialism (unpublished because he did not want it published: all of the work he approved for publication has now been published in three posthumously published edited volumes). Here Vrousalis deftly explains Cohen’s criticism of all forms of markets, and argues that Cohen should have been more enthusiastic about the values of collective planning than he apparently was. How, then, should be judge the success of this book? Vrousalis suggested that it should be accessible to those who do not know Cohen’s work. I suspect, though, that the issues will seem very abstract and decontextualized for those in that unfortunate position. Furthermore, as Vrousalis notes much of Cohen’s work is generated by his responses to Nozick, Dworkin and Rawls. The work of these philosophers is presented only to the degree that allows Vrousalis to bring out Cohen’s response, which inevitably makes them seem weak and under-motivated. Hence one would need to know at least some of the deeper background to be able to appreciate the issues discussed. But perhaps the main question is whether Vrousalis has been able to discern and display a real unity to Cohen’s work. As noted, there is a moral and motivational unity in terms of choice of topics and general orientation to them. This is brought out in the phrase ‘back to socialist basics’. There is also a type of methodological unity, in the application of the spirit of analytical philosophy, and the high premium on clarity, distinctions and argument, and Cohen’s reluctance to engage in big picture thinking of his own (as distinct from in the interpretation of Marx). But Vrousalis does not get very far in convincing that there is a type of unity of project, either in general conception or in a neat fit between different components. And it is probably right that there is no secret key that assembles Cohen’s work into a systematic whole. The main achievement of the book, rather, is that it is a balanced and accurate assessment of the complexities of Cohen’s entire contribution to political philosophy. It will be especially useful for those who are aware of only one or two phases in Cohen’s development, and seek an overview of more. It is, therefore, a highly valuable contribution.